My doubts about whether to offer this article for publication have been assuaged by the thought that in the British press, and some other English language media, the summer holiday period has long been known as the “silly season”. With two more days of August still available I’ll take the proverbial bull by the horns and will leave it to Puppetring’s editorial team to decide whether or not to give what follows an airing. 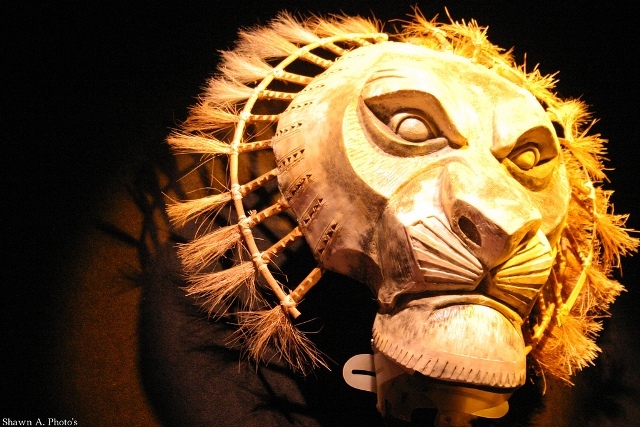 “Mask at the Lion King Museum”. Photo by Shawn Ashley – from flickr. This is a prequel to another article I intend to write of a more solemn nature, a reflection on the imagination, and on what the imagination is capable of conjuring up; a kind of puppetry of the imagintion I think one could call it. In this instance, however, my focus will be on the mind, or at least the central nervous system, of certain animals. However, before I go any further, I must mention my fascination with the idea of “projection” and how human perception involves, to a greater or lesser extent, the imposing of our inner, mental or emotional patterns, templates or passing mood (created of course out of complex physiological and psychological mechanisms in combination with experience) onto what we actually perceive – see or hear, above all – “out there”. Normal human perception and interaction thus involves a mingling of both our inner and the objective, outer worlds, and of the players in each of them. While this provides a rich field for speculation, research and performance ideas for all theatre practitioners, the notion of projection has especial resonance I believe for puppeteers. Often the suggested, the neutral, the minimal is so much richer than the explicit and fully described, because it “mates” with elements from each spectator’s imagination and their numinous world. The audience members then are all in some way involved in the collective experience; more profound than when we are merely recipients of a perfectly packaged and fully explained product, designed to be received within limited parameters. Anyhow, back to the beasts as, first of all we pay a brief visit to my mother’s garden. It is a small but lovely garden, laid out with much creative thought, and cared for through hard physical work. So it is no surprise that the cats, especially tom cats, that scrabble up the flower beds and mark their territory with excrement and urine are unwelcome visitors. When finely milled black pepper had no effect, my mother went a step further and found a solution in the guise of a product sold at garden centres. “Silent Roar” Pellets, steeped in the urine of LIONS! And so in a way, as I see it, my mother’s garden is populated by lions, in the imagination of all the local cats or populated at least by other cats very much larger than they are, and which they have no desire to meet face to face. Elephant by Royal de Luxe. Foto Royal de Luxe. I love this idea, and it came up in conversation with some French friends who live in a remote area of south west France. Oh, they said, we do the same. To stop wild boars ruining our vegetable patch. Lions?! I asked, as two episodes of Cervantes’ “Don Quijote” surfaced suddenly and entangled in my imagination. No! Elephants! 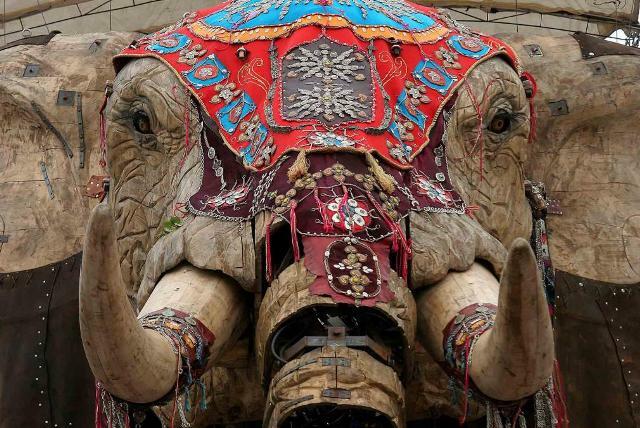 There’s a safari park not far away which – forgive me – apparently does a roaring trade in elephant dung, among the locals who are fed up with the ravages of artificially over-nourished and enthusiastically breeding wild boar. So, let it not be said there aren’t phantom elephants roaming loose in southern France, even if only in somewhat amorphous shape in the imaginations, or nervous systems, of numerous wild boar. The hunting season of course is about to start, and the silly season will soon be over. 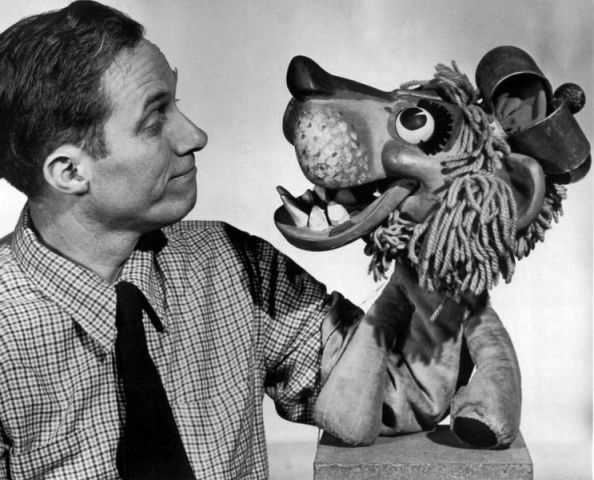 Bil Blaird with his lion Charlemane, from the television program The Best of Discovery. Previous“La Marionnette: Un espace intermédiaire au cœur des conflits”. Atelier de Karim Dakroub à Barcelone. Jours 18, 19 et 20 de Novembre de 2013. Rebecca Simpson is a writer, translator, actor and teacher.